I’ve been on enough airplane rides not to enjoy them, but on a flight out of Orange County last week heading up the coast, I was pleasantly surprised by what first appeared to be low-hanging clouds covering the Sierra Nevada Mountain Range, but turned out to be 14,000 foot peaks poking through the clouds covered with a light dusting of the year’s first snowfall. It was a beautiful reminder that fall is here and winter is fast approaching. My destination? Seattle, for the wedding of Chase Johnson, son of our long-time neighbors and good friends, Mark & Kathy – a great event. 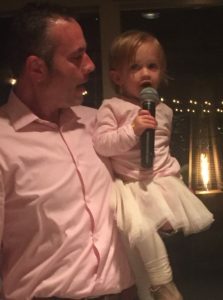 I had spent a good deal of time, years ago, working in Seattle creating a mortgage company within the offices of one of the largest real estate companies in the area, John L. Scott Real Estate. I remember traveling there nearly every week from October to April and never seeing the sun. But it’s a great city where one just learns to cope with precipitation. We had a list of Seattle attractions that we wanted to see between the wedding and the rehearsal dinner at Salty’s, which itself is a Seattle attraction. Never, and I mean never, go to Seattle and not have dinner at Salty’s, which sits across Puget Sound from downtown Seattle and affords you a spectacular view of the city as the sun sets and the lights of the city come alive. The morning we arrived, Seattle was showing off its beautiful, clear blue sky and a verdant countryside. We decided it would be a good time to go to the top of the iconic Space Needle, which sits downtown and was built for the 1962 World’s Fair and has been a major attraction ever since. 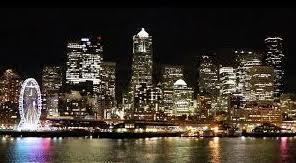 Views from there of downtown Seattle, Puget Sound, the lush neighboring hills and distant mountains, are spectacular! The ‘Needle’ also now has a revolving glass floor on top that, if you have the stomach, provides a feeling like you’re walking on air – a ‘Don’t Miss’ attraction! Directly below the Space Needle is the Chihuly Garden & Glass Exhibit. If you’re not familiar with Dale Chihuly’s work, you may have seen it in Las Vegas at the Bellagio, Aria or the Wynn hotels – those spectacular glass chandeliers are his creations. His exhibit here features his work in a glass house and a glass garden – amazing! 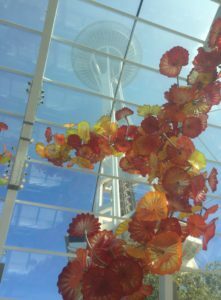 As long as you’re visiting the ‘Needle’, see Chihuly as well. With the next day came a steady rain – OK, this was more like the Seattle I remember, complete with gridlock that makes L.A. traffic look like a drive down Main Street in Mayberry. It was a good day to do the ‘Underground’ tour. I didn’t know what to expect, other than it was going to be out of the rain and probably . . . underground. I’d been told that it provided some interesting insights into the history of Seattle. It did not disappoint. The docents were informative and hilarious as we wandered through the underground rubble and artifacts that was once downtown Seattle and now sits a story below today’s street level. Not for the claustrophobic, but a must for the history buff. Great experience! 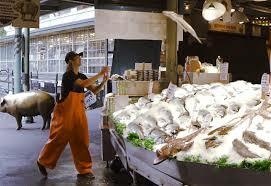 Not wanting to dally on our way home, we walked a few blocks to the Pike Place Fish Market and watched them throw some Halibut around as well as be amazed at the awesome array of beautiful flower bouquets all along this outdoor mall. Yes, we managed to squeeze all that into just a day and a half in the Emerald City – we were truly Restless in Seattle.